California has declared a state of emergency after enduring months of a drought that has left the state with only half the rainfall of the lowest rainfall year on record. Nothing captures the foreboding more than these two stark images. California farms supply food to many other parts of the country and the world, so drought here could have dire repercussions economically. 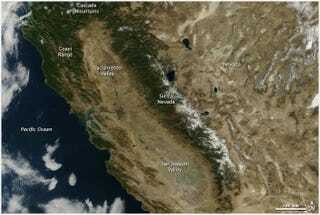 Above, you can see a satellite photo of California's Sierra Nevada mountains taken a few days ago. Below, is a photo taken of the same place one year ago. Note the radically different snow cover, and how the valley areas are a barren brown instead of a deep green. For those of us here in California, it feels like the apocalypse may begin with balmy, beautiful weather.